Lunar Rescue is a combination 2-D simple flight simulator and 2-Dimensional shooter. You start the game by floating within your mother ship. You then either must release your lander or after a pre-determined period of time, the mother ship will forcibly eject it. 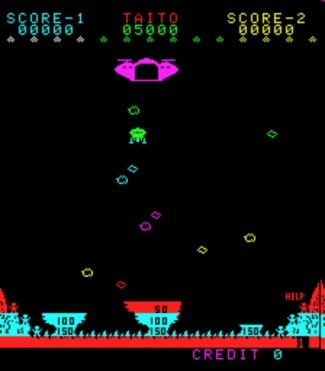 You first have to navigate through six rows of asteroids to make it to one of the landing platforms. You have six platforms initially but each landing will eliminate one since there is one platform per astronaut you have to rescue. On your return trip up, the screen changes and now you have saucers trying to destroy you with laser fire. Again, you will either have three or six rows of saucers depending if there are meteors in the area. You then must successfully land in the docking bay of the mother ship to get credit for a successful rescue of one astronaut.